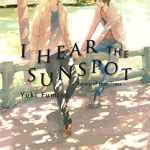 At a gathering of friends, Chii meets a young man who instantly falls in love with her, but Chii is hesitant to date him because she doesn’t quite feel the same way. After a few informal dates, however, she finds herself really falling for him.There is just one problem; he wants her to be his girlfriend, but he doesn’t know that she is in the middle of her gender transition. Afraid of losing him but also afraid of him not knowing the truth, she finally tells him that she was assigned male at birth which, to her surprise, doesn’t phase him in the least. 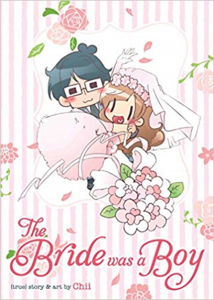 With the start of their relationship, Chii finds herself on the long path to legally changing her gender and to becoming a bride! 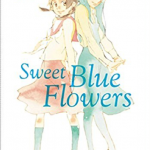 This delightfully sweet manga memoir chronicles Chii’s relationship with Husbandkun and the steps she had to take to legally transition to female in order for them to marry. Illustrated in a whimsical chibi format, Chii tackles serious issues of equality for LGBTQIA+ individuals in Japan in an endearing yet respectably informative way. Intermixed throughout the volume are side comics on LGBTQIA+ terminology, symbols, myths, and social/cultural issues. 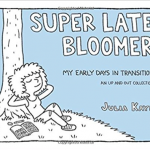 A distinctive addition to graphic trans memoirs, The Bride was a Boy provides an impressive juxtaposition to the U.S. graphic memoir Super Late Bloomer: My Early Days in Transition in addition to continuing the trans manga tradition of titles such as Wandering Son. Frankenstein’s monster, a creature who once only sought love from his creator, has returned and no longer cares to keep the peace. He is now the Destroyer, a being who walks the earth and tears apart anything in its path, including people. Meanwhile, Dr. Baker is conducting experiments to bring back her twelve-year-old son who was fatally shot by the police. No longer trusting society, the lab she used to work for, nor her husband, she sequesters herself away from the world. Two scientists find her, and the merging of both the world of Mary Shelley’s Frankenstein and the present collide. 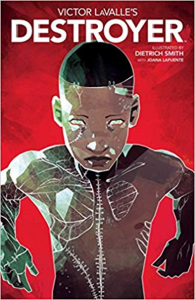 This 6-part comic book compilation asks what would happen if Frankenstein’s monster was real, all while bringing up issues of race, class, and gender, as well as issues of misunderstandings and miscommunications. The darkness of the art really sets the mood and conveys the built up emotions of the characters. 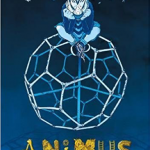 Images of violence and some gore makes this graphic novel more suitable for older teens. Scifi and horror genre lovers will appreciate this updated version of the classic Frankenstein by Mary Shelley. It could pair well with an English class that is reading Frankenstein. 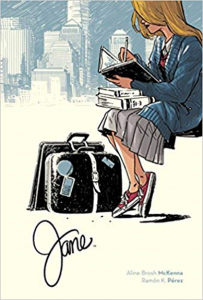 Jane by Aline Brosh McKenna, illustrated by Ramón K. Pérez. As soon as she’s saved up enough money, orphaned Jane flees her aunt’s broken home to live in her roommate’s pantry and study art in New York City. She soon takes a job as a nanny for widowed hedge fund partner, Edward Rochester in whom she finds a blossoming romance and attempts to unearth his paternal support for his daughter. However, Jane finds herself in danger, and in the midst of the action, as she’s wrapped up in the drama surrounding the supposed death of Rochester’s wife. This modern retelling of the Charlotte Bronte novel, Jane Eyre sweeps readers into the fast-paced and lavish high society Manhattan lifestyle. What starts off as charming pencil sketch illustrations, gradually becomes bold and colorful as Jane settles into her New York life: pastel yellow and green during non-working hours, blues and purples while in Rochester’s presence, and orange and red during emotional and action-packed scenes. Layouts and changing frame sizes keep the pace moving over this months-long storyline as images that bleed off the page provide for moments of fantasy and reflection just before plunging back into the action. 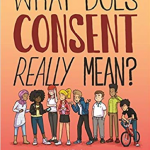 Recommended for fans of modern retellings, author Bryan Lee O’Malley, as well as dramatic high society stories like Gossip Girl.